One of the pleasures of writing for online journals is to read the quick responses to what you have written. They provoke you to further thought. Some who have commented on my articles in Eureka Street have asked why I do not address such central Catholic questions as abortion and gay marriage, why I do not defend Catholic teaching, and why I so often endorse minority left-wing causes. The implication is that I value my like-minded friends over my faith. These are fair questions about which I have often thought. My response to them is necessarily personal, not given on behalf of Eureka Street. I hope it may spark further conversation. In the first place, I am comfortable with the broad lines of Catholic teaching on areas such as sexuality, respect for life at its beginnings and its end, and the importance for society of the traditional form of marriage. Although I am critical of the detailed conclusions that some draw from this teaching and of the alienating language in which it is often presented, its consistent focus on respect for human dignity in all aspects of human life informs my own understanding. That is where I stand. If people reject me because I have these views, I don't much care. Nor do I preen myself if people applaud me for them. Both rejection and applause are shallow responses. There is more to life than being a groupie. My publishing hero is Dorothy Day who lost half the circulation of the Catholic Worker with an editorial in which she argued that Catholics should not support Franco's armed uprising against the Republicans in the Spanish Civil War, and lost another third when she condemned the nuclear bombing of Hiroshima and Nagasaki. My critics are right to say that in Eureka Street I write often on some issues but neglect others. There are many reasons for this selectivity. In the first place I know more about some things than others, more about refugees and church history, for example, than about moral theology and science. I am happy to leave many subjects to the better informed. More important, though, I stay away from some topics because I cannot reasonably hope to evoke from my readers the response that I wish. When writing for Eureka Street, which is written in a public language for a public audience, I want to find a perspective and arguments on particular issues that will encourage readers to move beyond their initial judgments, to reflect on these issues, and then to reach their own conclusions. But in trying to do this I, like any writer, am at the mercy of my readers. I must consider not only what I want to say, but also what the reader will hear. In my judgment, any article in Eureka Street that simply expounds or defends Catholic faith in Catholic theological language will leave too many readers fixed in the judgments with which they come to it. They are likely to barrack for it or against it without reflecting on the issues it raises. Such articles work well in magazines written for a Catholic audience open to such language, and I do write occasionally on such topics there. But for a public magazine, articles concerned with religious faith work best when they explain the logic of faith and practice in a public language, or when an exploration of Christian faith illuminates issues that are of interest in the broader society. These are the kinds of article we publish most often. It is particularly difficult for a Catholic priest to make space for reflection when writing about church authority, sexuality or gender, as on topics like abortion, gay marriage or women's ordination. Many readers instinctively assume that the writer is a dutiful hack of an authoritarian church, who is buying into issues on which no man, particularly a celibate one, will have anything pertinent to say. Such instinctive perceptions, even though unfair, crowd out any space for reflection, and make writing on these issues something best left to others. I am happy to write for a magazine that carries many articles about minority groups whose dignity as human beings is not respected. To insist on the dignity of those most disregarded in our society is a thoroughly Catholic thing to do. Those who endorse Catholic teaching on sexuality and on the value of human life should rejoice when they see such insistence. Human dignity is seamless, and conversation about any aspect of it opens out to other aspects. I don't care much for being called predictably reformist and progressive. Such labels don't help conversation. They often insinuate that the world is divided into secular lefties who don't take sin seriously and Catholic conservatives who do. But it is precisely because I have a realistic understanding of human sinfulness and of the impact of greed on society that I attend to the ways in which people are marginalised and that I plead for a better society. If to do all that is to be reformist and progressive, it is also a thoroughly Catholic thing to do. That's a pointed and very eloquent piece of writing, and I think it catches at a very subtle thing true of Eureka Street, its prime virtue (beyond fine writing and wide array of subjects and angles); it's about the underlying revolutionary genius of Catholicism, it's about the stunning idea of Catholicism, it's about love and justice and hard choices about what's real and what's illusion. Arguing about gay marriage, or power plays among ostensible authorities, seems foolish to me, when subjects like murder and poisoning on the global scale are at play. Or think of it this way: why does Eureka Street matter, when so very many Catholic periodicals are mere newsletters or shrill defensive screeds? Answer: because it's chasing the deepest game in the forest, the biggest ideas -- grace under duress, love against darkness. For which I commend it, despite the fact that I have to actually read it when it comes, rather than happily ignore it. I blame the editors for that. Andrew, this Uniting Church reader keenly welcomes your articles, especially those on refugees and justice - partly because I also do some work with refugees here in Shepparton. And on Israel-Palestine: this week's was a very helpful article - as indeed I find all you write: helpful. thought-provoking, illuminating, wise... May you write many more articles, which enrich my mornings and inspire hope! Thank you Andrew. I am one who believes there to be no need for your apologia on such matters. Those who require one appear to me to be forgetful of the one who was deemed 'a friend of prostitutes and sinners'. Long may you continue to espouse the human dignity and rights of the marginalised. Andy, I do not write to applaud or reject, but to nod. I cannot help but agree with the other comments. Your calm reasoning draws out elements of the justice issues that beset our world and opens our sometimes myopic views to other dimensions. Thank you for continuing to stand for reason & rights. I came away from a scripture study group last night disturbed by the consensus that child labour now, and slavery during Old Testament times, is/was quite acceptable, because the children/adults themselves are/were quite accepting of their lot - and that Jesus did not say anything in objection to slavery. Help please! "To insist on the dignity of those most disregarded in our society is a thoroughly Catholic thing to do". Bravo!! We should put it on top of all our parish publications, on our phalactaries, our t-shirts, our bumper stickers. Thank you for your articles. Keep up the good works to help us keep informed and therefore give support. We all have the same basic needs, therefore tolerance is one of the most essential ingredients. Thank you, Andrew, for this profound reflection on why, how and what you write. Your emphasis on the immutable underpinnings of your work together with the need to be discriminating in which topics you choose to address and how you do so was helpful. Thanks too for the reminder of Dorothy Day, indeed a publishing hero! Those who are critical of you, Andrew, and of Eureka Street would no doubt say that all of the comments so far simply support their thesis that it's a left wing rag and completely miss your point. If we as Catholics cannot be compassionate and fierce defenders of human dignity, why are we Catholics? No Christian can question that the Church is meant to reach out to the marginalised. Indeed, the teaching of God's special care for the widow, the orphan and the foreigner goes back to the Old Testament. However, I suspect we are sometimes too ready to call those who a different, marginalised. This can then bestow on them the sanctity of victimhood. Thus they are beyond being questioned, criticised or challenged by us the self-righteous, judgemental majority. It is we who must mend our ways. The marginalised should just go on being who or what they are. None of us stands before the Lord except as a sinner, in need of repentance and conversion. However, I would that some of Eureka Street's contributors realise that this need also exists amongst the "marginalised". I may be wrong, but it seems most often criticism is aimed at, and most faults found with, Western Christians. I would have more respect for Eureka Street if it cast its eye more broadly. By way of example, Muslims and homosexuals are two groups that the magazine appears to identify as marginalised. There are often articles calling for better understanding and acceptance of these groups. Yet within Islam and Muslim countries, there is far less tolerance for homosexuality than in the West. Young gays have been hanged in Iran. Many gays in Western cities with sizeable Muslim immigrant populations know to give groups of Muslim youths a wide berth. Why not an article looking at this issue? Thank you Brian Doyle for your eloquent reponse to Andrew, who must, in my view, be true to his own nature ..yes, even before the church. The Spirt moves. I, too, as a member of a Uniting Church value your writing on social justice and think your stance on not pushing Catholic dogma quite appropriate. I thank God for priests like Andy Hamilton and Eureka Street. I always enjoy your columns. For me your writing does not come across as 'progressive' but 'radical' and 'orthodox'. Apologies for adding labels! Thank you Andrew for yet another wonderful piece of writing, and Brian Doyle for your beautiful response. My precious mother, who has always believed that the Catholic Church and Catholic faith are two different things, started sending me your articles at a point when I began questioning my own faith. Identifying as a young, liberal-minded Catholic is not always easy (many of my friends and peers would try to suggest that liberal-minded Catholicism is an oxymoron), but your articles (and indeed "Eureka Street" in general) reassure me that the struggle is worth it. Articles such as the one above help me see that while it may not always be easy to express my views on certain topics, maintaining a liberal-minded, compassionate, loving Catholic faith certainly is. One of the paradoxes of the Catholic church is that without shifting its basic position it can seem politically left-wing or politically right-wing according to the context in which it operates. Traditionally identified with the Right in its anti-communism, its concerns with social justice often leads it to adopt an opposite stance. But that doesn't mean that it's okay for Eureka Street to sound like Green-Left Weekly minus the pro-abortion articles. "Progressive" is sometimes taken as code for someone who doesn't believe in God anymore. If Eureka Street is doing what it is doing in the name of the Catholic church then it needs to do what it says on the tin and where those without faith, living in a fallen world tainted by modernity suddenly find themselves illuminated by grace. It's not about YOU, Andrew. It's not even about a fairer society. It's about God. Andrew, Australians need Eureka Street! However, as another independent online journal (New Matilda) sinks, I hope Eureka Street will take on some refugee journos to complement the Catholic point of view. I appreciate your regular analysis of current events, however I would love to see diverse points of view in E.S. Is this Society of Jesus publication willing or able to open its windows a little to ecumenism, feminism, gay rights, Aboriginal rights? Please explain to this Uniting Church reader your editorial policy, which appears restrictive. Let's have dialogue! Fr Andrew, I cannot understand what you mean by a "public language". I have read many fine articles from Catholic publications that have both defended and challenged the Church's position on social and ethical issues. The writers were not concerned about people barracking or rejecting what they wrote. They wanted to explain or examine the Church's position via by plain and simple English. I don't see why a publication that is meant to be for a wider audience than committed Catholics needs some special mode of expression, called "public language". Thank you Andrew, I am 75, traditionally Irish Catholic, now not a regular churchgoer. As a Community health nurse and counsellor I worked with Drug & Alcohol and HIV. Now a volunteer in these areas and see people in prison - there I meet, the son, the brother, the husband, the mother, sister, daughter - all can discuss right and wrong and share their beliefs and feelings as I do share mine at an appropriate professional level. We know right and wrong because we are human. I will say, I miss the quiet time that used to be in the canon of the Mass - I always took the quiet time to reflect and pray - now it is all too chattery, keep it up Andrew, I value your comment. Of the comments on Andrew's Apologia I noticed three that did not echo the fulsome praise of 21 others. They were not highly critical but they made some pertinent and in two cases personal points. "Muslims and homosexuals are two groups that (ES) appears to identify as marginalised." Patrick James. I'm sure the ES editorial board will have its own take on these three criticisms but for me they illustrate why Eureka Street, and a writer like Andrew Hamilton, are both necessary if there is to be a public conversation on current social (in the widest sense of the term) issues. A conversation is not a lecture, an argument or a debate before an adjudicator. It is first of all listening 100% to other points of view (OPOV) and trying to understand them. It is engaging with the holders of OPOV and letting them know your own POV and why you hold it and why it is important to you. It is an engagement of minds not a battle of wits. At 17 I couldn't wait to get away from the Catholic Church because although we were told Cristianity was about love, forgiveness and inclusion, it appeared, as practised by the Church to be about terror, judgement and exclusion. I still don't see how the " the broad lines of Catholic teaching on areas such as sexuality, respect for life at its beginnings and its end, and the importance for society of the traditional form of marriage" are compatible with respecting "the dignity of those most disregarded in our society". But I do appreciate your writings here. What's that quote? ...(paraphrased) "standing on the edge can be challenging, but the view is magnificent"
What I like about ES and in particular this article of Andrew's is that that I have come to realise that what we constantly find most challenging is letting go of our need to be right, of the need to press an orthodoxy which must be accepted by all. The complexity of issues is to me the most interesting thing. The capacity to raise or listen to questions without needing answers - to see that life and faith is not cut and dried and all right or all wrong. To be able to sit with uncertainty and at times the mess of our varied ways of seeing issues, to be challenged where I feel certain - that is why I like to read ES. Are you Catholic enough, Andrew? Well, that's not for me to say. Are you an each-way bettor? Oh yes. I think you are. Why don't you have a go and bet to win once in a while. The risks are higher, but the rewards are much greater. And while you're at it, could you please do me a little favour and hold back for a while with the Jesuit cliche ('conversation')? If you keep using the word in every second article, Frank Brennan is never going to catch up. Thank you for your work, Andrew. You have little cause to explain, and none to apologise. Thank you Andrew Hamilton to your many reasoned and accessible commentaries on life through a catholic lens. Andrew I have always found your writing very helpful as I grapple with difficult public policy issues and circumstances. I appreciate very much your exceptional capacity to put into words what effectively becomes a public theological reflection. It resonates with me as an authentic and genuine response from someone for which the Gospel means so much. The dangers of all types of "Fundamentalism" either from the left or the right is to be simplistic expecting black and white answers to complex ethical issues. Life is not so simple in the mopdern world with the advances in modern science and technology. Each generation has to rethink its theology guided by the Holy Spirit and based on both our Jewish Christian heritage and our modern understanding of what makes life tick. What a wise man you are, Andrew Hamilton! I applaud you. Father Andrew writes, "...and of the alienating language in which it is often presented." Some of the most alienating language that I have read by posters at this site is directed towards John Howard and Tony Abbot. They are spoken of as if they are the devil incarnate. 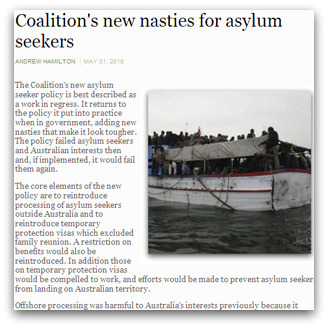 Tony Kevin suggested in an article here recently that a boat load of asylum seekers was allowed to sink with a substantial loss of life. All done by the cold blooded liberals. If we are going to demand that we extend dignity to Carl Williams, how about we do it our political or ideological opponents as well? When all is said and done, when all conversations are had, when we identify who is marginalised, who is outcast, who is the minority - the real issues still remain. The refugee issue is plain and clear in catholic teaching (help them) - but diverse sexuality is still an unresolved moral issue that leaves the so-called minority in a state of limbo if they choose to be marginalised. Andy, you say you have "a realistic understanding of human sinfulness". Catholic teaching accepts that the homosexual inclination is a result of both/either nature or nurture. If we accept this, is sinfulness really an issue here? And if we accept that homosexuality is a God-given inclination, can we then humanly expect a person to deny themselves the depth of a physical and sexual relationship just because of a legalistic theological code concocted by a church boffin? (homosexual inclination ok, but genital expression sinful....). ......The issues of poverty, slavery, refugees etc are simple.....its YES....lets help them...but when it comes to homosexuality it's not the scriptures that are marginalising people, but good old fashioned secular homophobia. And homophobia is a NOT a religious phenomenon. It's is sport, business, knitting clubs and pubs. It's the oldest game in the book. Thank you Andy for this and all your writing. Patrick James, tick, Jack Fawkner tick. I've appreciated some of your insights over the years, Fr H, but this article leaves me unconvinced. The logic re not articulating a defence of innocent unborn human life because you're a priest escapes me. Consistently, that means that no cleric - indeed no Catholic as such - should attempt to defend pre-natal life, because readers will assume that the writer is a hack for an authoritarian Church. What? Must card-carrying Catholics stoop to passing themselves off as atheists in order to gain a place at the table of public discourse in defence of the natural law? Nevertheless, I can't deny the power of your counsel: organs such as Eureka Street have certainly observed it to the letter. But your praise does the insistence of this magazine on the "dignity of most disregarded" in our society rings, thus, somewhat hollow. It's also noteworthy that on many of the issues you've chosen to argue are either irrelevant to Catholicism, or ones in which there is considerable room for bona fide Catholics to argue a diametrically opposite position - the issue of how to deal with asylum seekers, and Tony Abbott and "the poor" for example. Father Andrew, you seem to find alienating language abhorrent. You talk about conversation almost as if it is an end in itself. But what do you make of some of Jesus' own words, e.g. brood of vipers; hpyocrits; you are like tombs, clean on the outside but full of corruption inside etc. I am sure you know them far better than I do. Jesus was not backward in coming forward with a verbal lashing, if his ire was up. Are all harsh words to be condemned as alienating? Is a verbal lambast always to be avoided? I would truly appreciate your thoughts and some clarification. Thank you for being so honest. In a world of such rapid change, we all need encouragement to shake up our thinking. It is my view that our Teacher was pointing to a new way of thinking and we should be encouraged to do as he suggested. He did not force anyone to his view, however, and we all know how the closed minded of his culture treated him. 'you can always idenify the pioneers by the arrows in their backs1!" To me, the essential teachings of the gospels and subsequent catholic social teaching are consistent with the strong view of the sacredness and dignity of human life which you promulgate in your articles. As a Catholic, I thank you for them and look forward to reading them so as to inform my own views and knowledge. Yes, it is true, the Gospel tells us that Jesus did criticise others - brood of vipers and hypocrites. But this was Jesus who was doing the criticising! He also said for the one without sin to cast the first stone. Which of us are in the position of being without sin? Can we really exclude ourselves from among the hypocrites and be satisifed that Jesus only meant those other people, who are not like us? I think not.